MAX Board member Nick Wade is hosting a new monthly event series we’re calling “Wooftop Wednesdays with Nick Wade”. On the second Wednesday of each month, join Nick in exploring the rooftop bars of San Francisco. Nick will choose a different rooftop lounge each month. 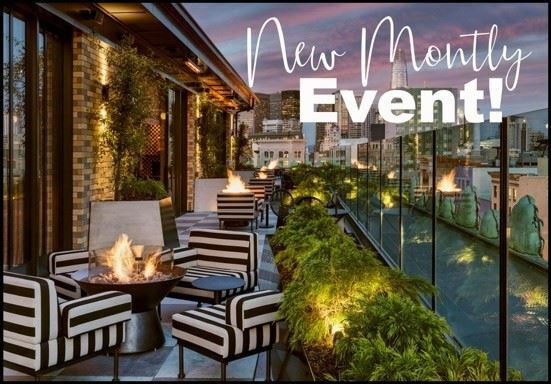 This new monthly event kicks off with a visit to Charmaine’s at the top of Proper Hotel. When elevator doors open 120 feet above Market Street, you’ve entered the rooftop bar and lounge San Francisco has been waiting for. Here, the energetic chic of a European terrace meets the laid-back vibes of “California cool.” In addition to bar snacks, cocktails by BVHospitality (Bon Vivants, Trick Dog) feature the vibrant flavors, original combinations, and unique bitters and syrups for which the duo is known. There is no admission fee and a no-host bar. Stop by between 5:30-8:00pm and have a drink with Nick and other members of the MAX community and enjoy an amazing view of the city. Please RSVP on Meetup here to let Nick know you’ll be joining him, or if you prefer, click Register on the left to RSVP here.